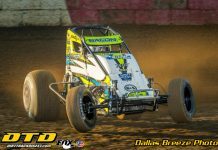 Last year, Bridgeport Speedway regulars successfully defended their home turf against the Super DIRTcar Series travelers. 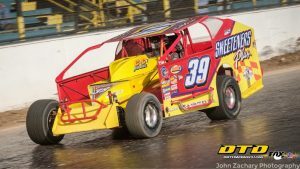 On Wednesday, May 16, the Super DIRTcar Series stars will be looking to take the fight back to the New Jersey faithful on Bridgeport’s big track – the extremely fast and racy 5/8 mile clay oval. It was Ryan Watt from Boyertown PA who captured the win after 60 hard-fought laps last year. Although technically the same size as Oswego Speedway, the home of NAPA Super DIRT Week, Bridgeport Speedway’s 5/8-mile track is unique in its own right. Tacky and fast, the New Jersey clay allows drivers to hit seriously high speeds. Tim McCreadie is the Super DIRTcar Series track record holder with a 20.182 second lap, a 111 MPH average speed. No single driver has been able dominate the 5/8-mile Bridgeport Speedway in Super DIRTcar Series races. Only two drivers have multiple Series wins going back to 1976: Billy Pauch and Frank Cozze, with two Series wins each to their credit. The last Series regular to win was Danny Johnson in 2005. Will records fall? Will a Series driver claim victory at the Battle at the Bridge? Series regulars will have to contend with stout competition from tri-state Big-Block Modified pilots like veteran Billy Pauch, hot-shoe Jeff Strunk, and last year’s Battle at the Bridge winner Ryan Watt. The Super DIRTcar Series tour regulars will bring everything they have to conquer the Battle at the Bridge in 2018. 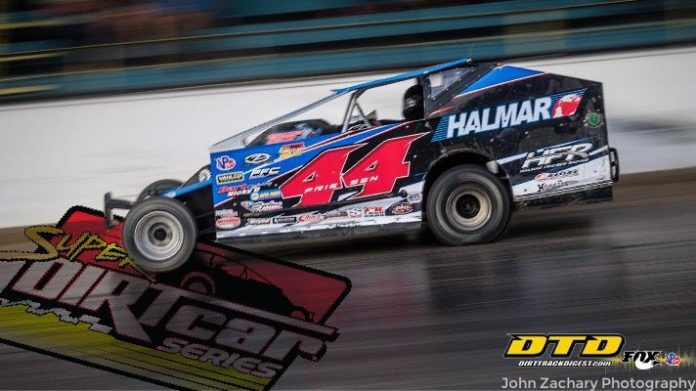 After an exceptional four race stand at Volusia Speedway’s DIRTcar Nationals in February, Super DIRTcar Series stars were anxious to start racking up championship points at Fulton Speedway. Unfortunately, rains swept away any chance of taking the prestigious Highbank Holdup 100 from green to checkered. 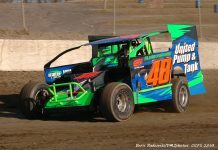 Fans who attended Friday night’s portion of the Highbank Holdup Weekend were treated to two Big-Block Modified Hot Lap sessions. Series regulars Peter Britten, Max McLaughlin, Jimmy Phelps, Billy Whitaker, JF Coriveau, and Adam Roberts all took to the track for a shakedown of their 800 horsepower Big-Block Modifieds. Fans were happy to see Peter Britten return to the track after a non-racing related back injury prevented him from traveling to the DIRTcar Nationals. Britten has teamed up with Ray Graham to mount an assault on the Super DIRTcar Series championship in 2018. 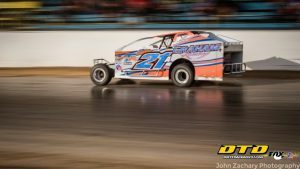 The 21a debuted a stunning new livery during Fulton Speedway Hot Laps as well. Before taking the Halmar Racing NASCAR Truck to Charlotte Motor Speedway on Friday, Stewart Friesen will wheel his no. 44 Big-Block Modified at Bridgeport Speedway for 60 laps of action. Friesen will be looking for maximum points in the Series’ first point-paying race of 2018. In other Series news, two more drivers have signed Platinum Driver agreements for 2018 bringing the total up to 17. Adam A-Train Roberts and long-time asphalt modified racer Rusty Smith will start their campaigns at the Battle at the Bridge. General Admission tickets for the Battle at the Bridge are $30, and reserved tickets are $35. Kids (10-15) General Admission is $15, and Children 9-and-under are free. Pit entry is also $35. Hot Laps start at 6:15 PM with racing at 7:15 PM. Visit Bridgeport Speedway’s website (add link) for more information. The Super DIRTcar Series is the premier Big-Block Modified tour of North America. 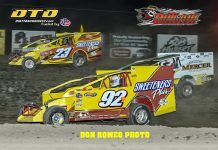 Tour regulars, such as eight-time Series Champion Brett Hearn and current title-holder Matt Sheppard, pit their 800 horsepower Big-Block Modifieds against the best short track racing drivers over a 35-race schedule on 21 tracks from Canada to Florida. In 2018 there are 17 drivers contending for the Series Championship.